You only need to step outside to realise we’re in the winter months – the woolly hats are out, the air is fresher and colder than ever and you can officially see your breath again. The good news, however, is that this means Christmas is coming to Altrincham! You may have to put three extra layers on before leaving the house, but everyone’s starting to feel a little bit more festive as Christmas lifts its happy head. So, let’s take a look at some of the seasonal cheer on offer in Altrincham this Christmas. 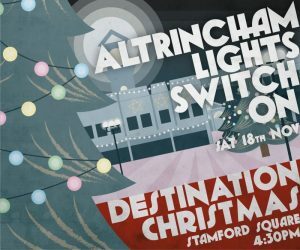 On Saturday 18th November, Altrincham will be full of Christmas cheer for the annual Christmas lights switch on. From 4.30pm, the famous faces of Mike Toolan and Matt Haslam from the Key 103 Breakfast Team, alongside Coronation Street’s Brooke Vincent, will host an hour-long show of family fun and entertainment. Taking to the stage throughout this hour will be CBeebies’ stars, Manchester’s newest boyband ‘Yes Lad’ and the wonderful Little Belters Choir, made up of Altrincham-based primary school children. It’s never quite Christmas until the lights are switched on, don’t you think? Altrincham is famous for its market, bringing wonderful antiques, moreish food and unique drinks to our town on a weekly basis. Well now it’s time for the market to get festive. So, can we look forward to? This year you can take your pick from one-of-a-kind gifts, the best regional food & drink – with a Christmas twist, contemporary cards & decorations, live music and festive cheer. Sound good? Altrincham’s legendary Christmas Markets will be back from Tuesday 21st November, and will run every Saturday, Sunday & Tuesday until 23rd December. Do you have a love of timeless music and much-loved seasonal classics? Then this event is for you! Altrincham’s Stamford Orchestra brings the local community together to hear and learn about the music of the greatest composers that ever lived – and this year they’ve included Christmas classics to get everyone in a festive mood. From Tchaikovsky’s Nutcracker to Silent Night, there’ll be something for everyone to enjoy and sing along to. The event takes place at the Altrincham Market on December 11th and all proceeds go to Francis House Children’s Hospice. Those are just some of the wonderful upcoming Christmas events in Altrincham. To see a full list, click here. If you’d like to enquire about moving to Altrincham and having this festive cheer plus many more fantastic annual events right on your doorstep, give us a call on 0161 929 1500 and find out more about Altrincham’s newest apartment block, Altair.